Properties in Sabbathday Lake average 4.7 out of 5 stars. The Wee White Cottage on Tripp Lake in Poland, Maine. Property 10: The Wee White Cottage on Tripp Lake in Poland, Maine. Dog-friendly lakefront home w/dock, swing & great location - perfect for kids! Property 11: Dog-friendly lakefront home w/dock, swing & great location - perfect for kids! Property 12: Lakefront views at this charming cottage with private dock, dog-friendly! 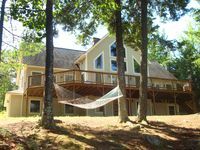 Waterfront Casco Cottage w/Dock on Coffee Pond! 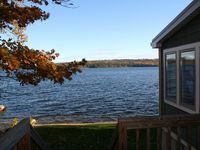 Property 13: Waterfront Casco Cottage w/Dock on Coffee Pond! Wow. Amazing and tranquil. 10 year old home. This is IT!! Property 23: Wow. Amazing and tranquil. 10 year old home. This is IT!! Lake front sandy beach facing fantastic sunsets!! Property 24: Lake front sandy beach facing fantastic sunsets!! Superb Lake Waterfront/Beautiful Sunsets/Spacious Great Room/Kayaks & Lake Gear! Property 27: Superb Lake Waterfront/Beautiful Sunsets/Spacious Great Room/Kayaks & Lake Gear! Lakefront Cottage on prestine Upper Range with Large Dock 2 Kayaks & Canoe. Property 29: Lakefront Cottage on prestine Upper Range with Large Dock 2 Kayaks & Canoe. Beautiful Cottage on Prime Location On Sebago Lake! Property 32: Beautiful Cottage on Prime Location On Sebago Lake! Property 33: Lakefront With A Beautiful View! Property 41: COME LISTEN TO THE LOONS! Panther "Jewel Of The Lakes Region"
Beautiful house with an amazing view! Fully stocked, clean and warm during the cold december nights! We loved everything about it including the location. Michael was super helpful with any area recommendations and quick to respond to any questions! Would definitely come back again!